Claudio de Carli is proud to announce that his MX2 World Championship team will from now on be called the 塑amaha Red Bull De Carli Team・ signifying the stronger collaboration between the team and the world leader in the energy drinks market. Since 2006 Red Bull has been a team partner and after two very successful seasons, in which Antonio Cairoli finished second in 2006 and celebrated his second MX2 World Championship title this year, both parties agreed to intensify their relationship. Partnering title holder Cairoli in the 2008 MX2 world championship will be the team痴 current riders Matteo Bonini and Alessandro Lupino, all riding Yamaha YZ250F machines tuned by the team race department under direct supervision of Claudio De Carli. The agreement, sealed with a simple handshake between Red Bull Motorsport management and Claudio De Carli, offers the team many opportunities to further strengthen its structure and competitiveness. After the earlier announcement of Youthstream that Red Bull will be the official energy drink of the FIM Motocross World Championship for 2008, 2009 and 2010, as well as the title sponsor of the MX of Nations, Red Bull痴 increased involvement in the Yamaha De Carli team is a yet another confirmation of their trust in the potential of the Motocross sport. The racing team of Claudio De Carli was created in 1994 at the time when Claudio痴 active riding career had ended. In the eighties De Carli was one of the best private riders in the Motocross World Championship and the first Italian ever to win a race in the 500cc World Championship. Since the start in 1994 Team De Carli has been with Yamaha, winning their first 125 world title in 1997 with Alessio Chiodi on a Yamaha YZ125. In 1999 the team came close to another 125 world title when Claudio Federici finished second. Today痴 dominant position of the team in MX2 started with the arrival of arguably the biggest star in Motocross today, Antonio Cairoli. 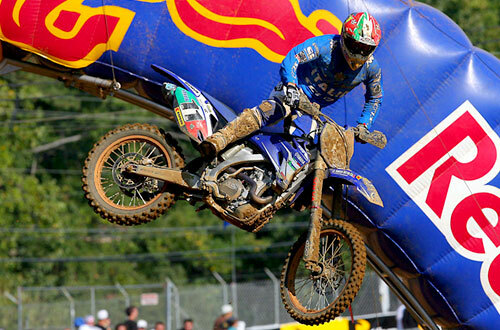 In his first full season in 2004, riding the Yamaha YZ250F, Cairoli finished third. He won his first MX2 world title in 2005, finished second the year after, but won back his title by crushing the opposition this season. Other accomplishments of the team include many national Italian championships as well as contributing to Italian Motocross des Nations victories in 1999 with Claudio Federici and 2003 with Alessio Chiodi. Antonio Cairoli, born in Patti Italy on September 23 1985, also has other prizes added to his tally which include the 2006 European supercross title and two MX2 Italian titles won in 2006 and 2007, of course all won with the Yamaha Red Bull De Carli Team. 典onio・is only twenty-two years old, but with 21 GP (one in MX1) and 48 heat victories (one in MX1) he is already the most successful rider on the MX2 starting list. In Matteo Bonini, born in Castelnuovo Monti Italy on September 20 1985, the team has another rider with winning potential. This year Bonini finished third in the MX2 Italian Championship and frequently proved he could ride with the fastest riders in the World Championship.